All transactions are safe and secure with a reliable history in online purchasing behind each of our associates. 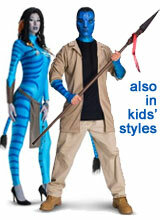 Buy the Avatar Costumes to own Avatar clothing and merchandise. Get one step closer to the magical world of Pandora with these Jake and Neytiri Avatar costumes, masks, wigs and accessories. Perfect for Halloween or your next costume party, these outfits will allow you to embody your favorite characters from the film without ever leaving Earth. For men and boys, there is the Jake Sully costume that shows everyone that you are a rugged warrior who is ready to protect the Na'vi. For women and girls, there is the stunning Neytiri costume complete with bold blue stripes, gray apron, arm gauntlet and tail. Also browse Avatar masks and other merchandise. In addition to the Avatar Costumes above, browse the Avatar Clothing Gallery for more apparel like men's and women's clothes, kids shirts or hoodies.